What is the Deluxe Elite Arm Sling? The deluxe elite arm sling has been specially designed for use following a shoulder injury or shoulder surgery and features a foam pad to ensure of total comfort. The arm sling has an adjustable strap that provides extra immobilisation and hook and loop closures for easy adjustment. When can I use the Deluxe Elite Arm Sling? Use the deluxe elite arm sling to immobilise the shoulder to allow for healing following an injury to the shoulder or following shoulder surgery. 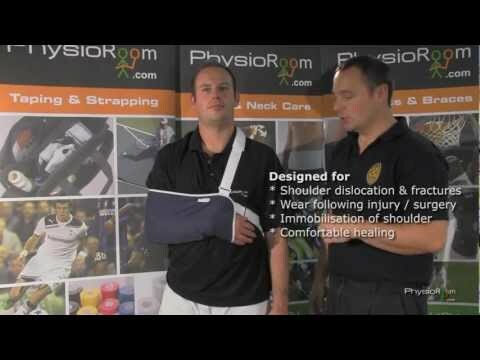 How does the Deluxe Elite Arm Sling work? Made from soft cotton / polyester the envelope style deluxe elite arm sling with foam padding features an adjustable shoulder strap that immobilises the shoulder joint in the most comfortable position for healing. The hook and loop closures provide easy adjustment while the foam pad ensures of total comfort. Keeping the shoulder still and supported helps to relieve shoulder pain and encourages healing following shoulder surgery or a shoulder injury. The elite arm sling is not suitable for use in a washing machine or dryer - use a mild detergent and cold water and air dry. Measure from the elbow crease to the wrist. If you are between sizes, please choose the larger size. PhysioRoom Deluxe Arm Sling w. Foam Pad - Pre/Post Shoulder Surgery Immobiliser - Shoulder Dislocation is in stock and available for immediate dispatch from our Warehouse facility in Lancashire, UK. Orders placed by 4pm Monday to Friday (excluding Bank Holidays) are dispatched the same day. If you need your PhysioRoom Deluxe Arm Sling w. Foam Pad - Pre/Post Shoulder Surgery Immobiliser - Shoulder Dislocation in a hurry, next working day delivery is available for UK mainland addresses.